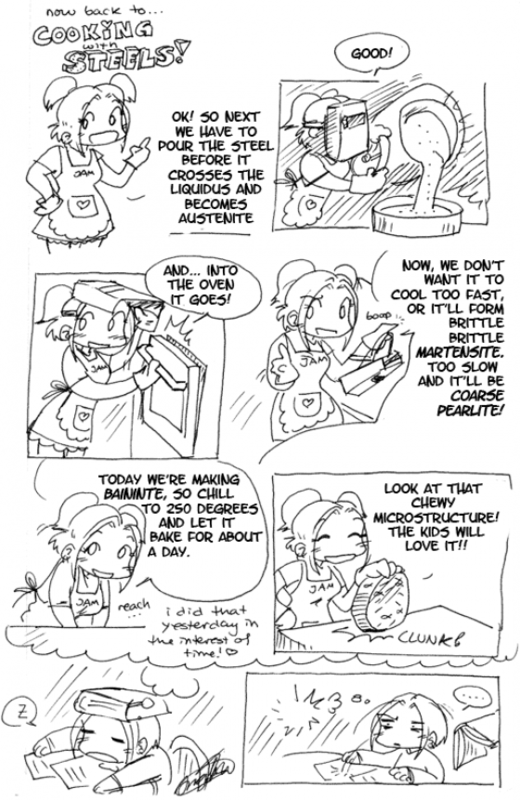 #321 - Cooking with Steel! Submitted by Marsillio on May 1, 2007 - 8:37am. Just means you like what you're doing. That's a very good thing. Loved the "... WTF?" expression in the last panel btw. And the fishies in the hunk of steel. XD Can't forget the fishies. Submitted by Marsillio on May 1, 2007 - 8:39am. Submitted by Anonymous on May 1, 2007 - 12:34pm. Submitted by Jam on May 2, 2007 - 10:05am. Quote:And the fishies in the hunk of steel. XD Can't forget the fishies. Submitted by Anonymous on May 1, 2007 - 7:18pm. Submitted by Anonymous on May 1, 2007 - 9:57pm. Submitted by Jay on May 2, 2007 - 6:33pm. Submitted by Marsillio on May 3, 2007 - 2:47pm. Ah yes, alpha phase. The part were dying fish preserve themselves with fire in the hopes that they may one day be revived and cure of their ailment. Submitted by Marsillio on May 3, 2007 - 2:48pm. Submitted by Jam on May 5, 2007 - 12:52pm. Alpha Phase is the 'coldest' phase with the 'least' amount of Carbon. Submitted by brakoth on March 5, 2008 - 12:58am. Submitted by ashiezorz on February 20, 2014 - 4:33pm. Submitted by AJ on May 26, 2008 - 9:30pm. Submitted by AJ on May 27, 2008 - 2:13am. Submitted by AJ on May 27, 2008 - 2:14am. Submitted by Pheldurin on December 15, 2008 - 2:41am. extensive experimentation has shown that heat treating a mixture of pasta and water makes a delicious alloy. and don't forget the parmesian precipitates. Submitted by reformingfarmer on January 20, 2009 - 1:30pm. Submitted by Intyalle on May 1, 2009 - 3:39am. You want to know about an odd imagination >< One day in Art I was just staring blankly at the wall and suddenly had this full on hallucination of tap-dancing pineapples, complete with tophats and canes ! It was in colour and there was music and suddenly the music stopped and it turned to black and white...-breathes-...and then it sort of fuzzed out and turned into the funeral of the main pineapple who had been SMOOSHED by some fat person >< Then, for some weird reason, there were two pineapples getting married at the other pineapple's funeral. Submitted by interwebman on May 5, 2009 - 7:56am. Submitted by crash on June 30, 2009 - 7:39pm. Best chef evar! Austenite cookies are still hot. Be careful, they'll burn your tongue! Why does the most scientifically informative comic make me laugh the hardest? Submitted by geekflip on December 30, 2009 - 1:06pm. Submitted by Wolfin on January 8, 2010 - 7:20pm. Are those fish in that steel cookie? Submitted by Maria E. on January 29, 2010 - 10:28pm. @Wolfin. It's the greek letter alpha, used to represent ferrite. Submitted by bnvoshol on March 17, 2010 - 1:40pm. Submitted by Daniel Terwilliger on October 22, 2010 - 8:06pm. Submitted by StenDarker on December 23, 2010 - 11:50pm. Submitted by shadowreaper5 on August 18, 2013 - 8:00am. Oh my god I just finished materials class and this FINALLY makes sense!